From March 6 – 12 I will have a project at SPRING/BREAK Art Show during Armory Arts Week. My response to the theme STRANGER COMES TO TOWN is a project I’ve titled (En)Coded Conversations. List of works at SPRING/BREAK Art Fair site, on consignment through April 30! Chloë Bass, Juanli Carrión, Gonzalo Fuenmayor, Alicia Grullón, and Riitta Ikonen are storytellers, who specifically engage their audiences in conversation, and who make work that speaks to strangers helping one another navigate new terrain. Sometimes these conversations are awkward and uncomfortable, but they are always about making connections and navigating safe pathways. Carrión grew up in regional Spain in a farming and wine growing county: members of the community knew one another, and everyone was connected. The butcher and the baker were essential community members; no one was a faceless stranger. When he moved to New York City he struggled to find ways to participate directly in his communities. As he navigated New York, he started to think about communities as ecosystems and his role, and our role, as plants in those ecosystems, and thus the idea of OSS gardens was born. The drawing for (En)coded conversations questions the text of the USA Immigration and Nationality Act by coloring individually its 148,123 characters to create botanical illustrations of the plants selected by immigrants interviewed for #OSS Manhattan. Alicia Grullon, serves up empanada and knowledge with her project Empanar! – a mobile art project working off Bronx street food culture and traditions from El Taller Gráfico Popular. Along with empanada, Grullon distributes flyers that provide information to immigrants on their rights and where to seek counsel. Gonzalo Fuenmayor’s Papare series examines ideas of exoticism and the complicit and amnesic relationship between ornamentation and tragedy. 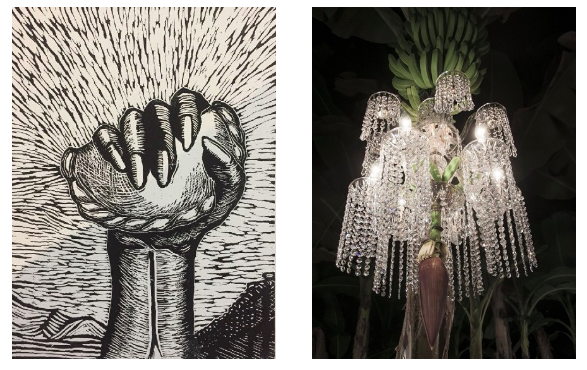 Opulent Victorian chandeliers and other elements, reminiscent of a decadent colonial past, proliferate from banana bunches, alluding to a tragic and violent history associated with Banana trade worldwide. The theatricality and dramatic nature of the imagery, subordinate the contradictory into a delicate and imaginative order, evoking a certain kind of reconciliation or tense harmony between disjointed realities. For Gather the house around the table, Bass produced a line of domestic materials that she uses to interact with her audiences – sometimes in plain sight, and sometimes nearly imperceptibly. Visitors are invited to take their place in at the table, using her objects to enact everyday poetry and share food. Riitta Ikonen’s photographs in which she costumes herself, and places herself in awkward conversation with built and natural environments are disguises. She is visible in plain sight, while also in conversation with a landscape. The works ask as to think about the costumes (or disguises?) we wear help us navigate new territory. Individually, these works speak secrets to specific audiences. Collectively, they help us navigate new terrain and make conversation with new communities.